The departure of the hunt takes place at Place Massena, exactly at the fontaine d’Apollon (fountain of Apollon). The Captain of the hunt will be there to welcome you. You will then choose how many members are in your team and the name of the team. Teams are made up of 4 to 7 members. If you are more than members it would be interesting to make 2 teams as this would lead to a healthy competition between you. A booklet will be given to each team. On reading this booklet you will discover the history of our beautiful city of Nice, as well as that of the pirate Black Morgan. Stage by stage throughout the game there will be puzzles to solve, taking you from place to place until finally, you will discover the hidden treasure. 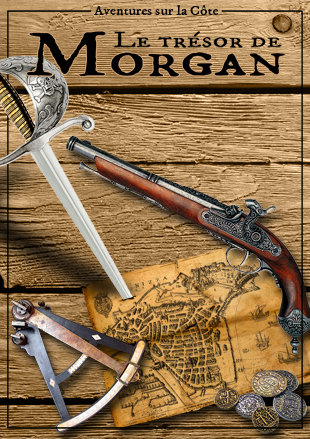 During the hunt, you will discover the wonders of the Baroque city, its natives, and its famous characters .. artists, writers, philosophers and explorers, they all emerge from the shadow of Morgan the pirate. You will feel the charm of what was called “la Nouvelle Ville” … the New Town, which was built in the nineteenth century during the Belle Epoque in order to accommodate the needs of new arrivals and tourists coming from all around the world. 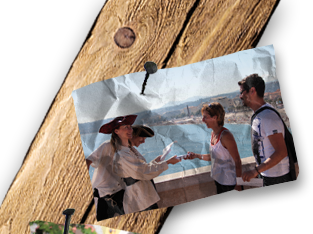 The route will take you around different viewpoints, through picturesque little squares, down dark alleys that smell of the middle-ages, where the buildings seem to reach up to join each other in the azur sky, to extraordinary places, even to places unknown to certain Nicois. Along the circuit you will encounter our disguised characters who will present you with varied quizzes and scrolls that will allow you to continue your quest. However, rest assured that this game is physically accessible to all. As for puzzles to be solved, you operate as a team, one of the members bringing their own particular knowledge in a certain area, another might bring his education to other subjects, others, an instinct, an insight, and others, a flair or a talent. No participant, no team can be left stranded. This is team work. As was so well expressed by Pierre de Coubertin, founder of the modern Olympic games, in his famous quote .. that “the most important thing is taking part”. So, future hunters, Good Luck !